Custom Operations Platforms - EGA Products, Inc.
EGA Products was commissioned by a world renowned manufacturer of tantalum and electrolytic capacitors. The challenge was to develop an exceptionally durable, elevated Operations Platform or their chemical wash station that could withstand heavy production schedules and multiple personnel usage. The operations platform must also be ergonomically efficient while simultaneously maintaining OSHA, ANSI, and local standards for workplace safety. Analyzing the time/motion and proprietary requirements surrounding the chemical wash operation, EGA engineers designed an elevated platform made of heavy gauge steel with welded construction. 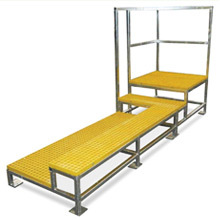 Guard railing is placed as necessary to protect workers, but careful design attention ensures that select areas adjacent to the machinery are left open and unencumbered for ease of operation. 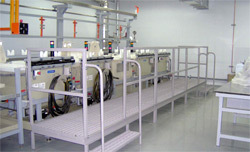 Rely on EGA precision engineering and manufacturing expertise to design and build custom operations platforms like these, and other equipment that will meet the specific people-access, materials-handling, or storage needs of your industry and its processes—no matter how simple or complex your requirements. Or know more about our other Custom Designed & Manufactured Products. 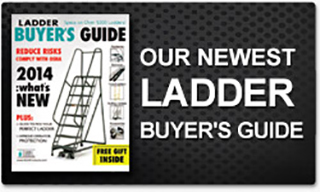 In the 9 years that I have been in the Material Handling Industry, I have had the opportunity to work with many manufacturers of ladders. I can honestly say that EGA has always been my first go-to to source for not only a standard product, but a custom product as well. The Reps at EGA are very responsive, knowledgeable and professional – resolving issues efficiently, providing a high quality product and shipping orders in a timely manner consistently.